UPDATE: GoldenEar Technology targets the UK | What Hi-Fi? We first saw these speakers and systems at the Bristol Show back in February, and now the GoldenEar Technology hi-fi and home cinema range is available in the UK through Karma-av. Prices and details in our original story below. 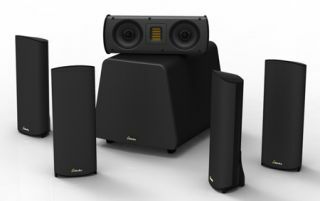 They've already made a bit of a stir in the US, where they've picked up a string of awards, and now GoldenEar Technology is bringing its extensive array of hi-fi and home cinema speakers to the UK market. They'll be available later this year, with prices starting from £800 for a stereo pair of Aon 2 bookshelf speakers and topping out at £4000 for the TritonCinema Two surround sound system. Other products in the range include the Triton Two floorstanders (£3000, right) with built-in 1200W subwoofer, the Triton Three – a smaller version of the Two – at £2000 a pair, Aon 3 (£1000), the SuperSat 50/50C surround speaker (£500 each) and the smaller SuperSat 3/3C at £250. There's a pair of active subwoofers in the shape of the ForceField 4 (£750) and ForceField 3 (£550). If you want a full 5.1 system, you can choose from the TritonCinema Two (£4000), TritonCinema Three (£3000), SuperCinema 50 (£2750) or SuperCinema 3 (£2050, below).